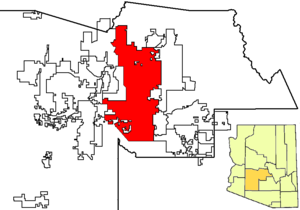 Phoenix (O'odham: Skikik, Yavapai: Wasinka, Western Apache: Fiinigis, Navajo: Hoozdoh, Mojave: Hachp 'Anya Nyava) hem i kapital blong Arizona. Long July 2009, populaesen blong Phoenix i stap araon 1,601,587. This page was last edited on 25 Januware 2016, at 08:26.